My family is peculiar. They like to sit after lunch and discuss food. They imagine the next meal and plan the ingredients. They also like to rant about a forever-changing world. 'Tomatoes grown in greenhouses', they say 'have no flavour, they must be 'kissed by the sun’ to be tasty. When the subject of freshly picked thyme comes up, the atmosphere shifts to bravado. ‘I only use the tip of the flower' or 'I pick mine from the top of the mountain, no dust or pollution' they add . Early in the summer, they all scour the mountains in search of wild thyme for zaatar, a mixture of thyme, sumac and sesame mixed with olive oil and spread on Manoushe. As far they are concerned shop-bought thyme is of course ‘mazghoul’ (tempered with). Later in the year they discuss sumac, another key ingredient to zaatar. They ponder on the shape and colour of the clusters, argue about the taste and debate where to buy them; Their conversation often lacks coherence but it nevertheless fills them (and me) with a sense of perpetuity. 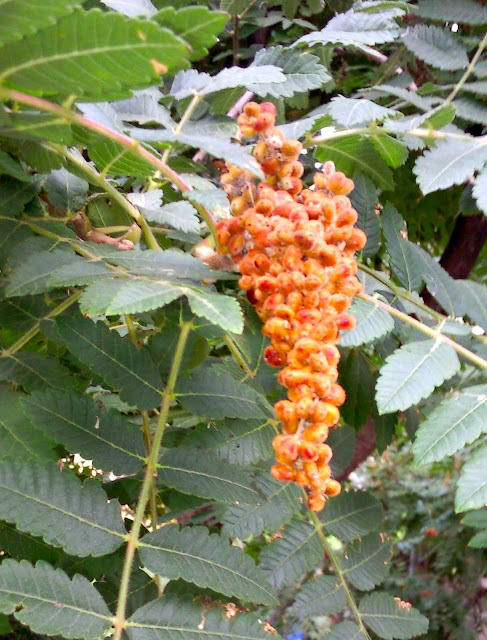 Sumac is a souring agent essential to Lebanese cuisine and that of the Levant. Native to the Eastern Mediterranean the deciduous sumac tree grows wild up to three metres high. First the flowers are white they mature into conical clusters of reddish furry berries. Turning the berries into a powder is time-consuming. When the clusters are picked they are left in the sun to dry. They are ground a first time and then put out into the sun again until completely dry. They are then ground one last time and finally sifted to separate the stones from the powder. Sumac is delicious in salads such as Fattoush, with meat, stuffings and sprinkled on fried eggs. Today I coated aubergine slices with sumac and sesame seeds. Slice the aubergines into rounds, sprinkle them with salt and leave them for 30 minutes. Rinse the aubergine and pat them dry on a kitchen towel. Mix the sumac, sesame and semolina together adding a little salt and pepper. Dip the aubergine rounds in milk and then into the semolina mixture. Make sure that they are evenly coated. Heat the oil in a frying pan and fry for about 3 to 4 minutes on each side. Serve with a dollop of home-made hummos.